Another good and better news for all subscribers in the airtel network as we now have been mesmerized by numerous data options to select from. Last time, Airtel launched the 2gb for N200 Naira and 6gb for N500 naira data plans but it wasn't cool for a lot of folks because it is only limited to 2g network (doesn't work on 3g or 4g LTE networks). 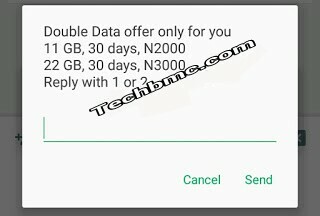 How Can I Get Airtel Double Data Plans? Note: the validity period for both plans is 30Days (one month). Another interesting thing about these data package is that it works on any network mode which includes, 2g, 3g and 4g.